I have been in Canada for 15 years. I don't "fit in" any "Community" in Canada. I do manage - barely - to just get by. I have great hopes for my future. But I find living in Canada basically unbearable. I just continue to do my research as my book was thrown away last year. Yesterday I focussed once again on my own PERSONAL healing. My mother was a brave woman who had a native child (from an upperclass seminole family) in 1942 and kept it. She was extremely beautiful. I grew up with a picture of Mount Vernon on the wall of our house - a house that was purchased cheaply on GI benefits. My eldest brother was the ONLY minority student in our neighborhood, but as he was young my family kept THE SECRET - saying that he was Pennsylvania Dutch, but my brother and I both knew the truth. My father met my mother while she was (illegally) in the Navy and he was a chief petty officer in Annapolis. His family always HATED my mother. I had a "psychic" event on the day she died - knowing that they were lieing about where they were going. Sure enough, I was totally correct and they were discovered during the Aquatennial in Minneapolis. My grandfather was a Mason and messed with the autoposy. So the entire event was labelled as "suicide pact", which it wasn't. My grandfather out of some GRIM rationale of his own did help out my eldest brother, giving him a job at the Minneapolis Park Board as a lawnskeeper. My brother Ronnie often serves as a groundskeeper in prisons - he's become totally institutionalized. Ronnie has 7 children: I have only met one of them. She was 13 years old, and he was already turning her into an alcoholic. As I type this I grow SO weary. My whole family is such a mess. I have been abandoned by them ALL. Every single one of them. To do my mother honor, I do everything I can for the native community. I helped found AIM in 1968 - with the help of Ronnie's high school friends. After my son was sexually abused, I went back to Minnesota hoping to heal from my problems. I don't think I got very far. Ronnie was out of jail but I couldn't take the alcoholism. Unfortunately I didn't stick around him long enough to meet his kids - and funny! but my younger brother doesn't give me accurate information on where to find them, either. I called him last week. However, this week, at the Canadian Day of Action, I met a Lakota who knows Ronnie ! He has a Harley (Ronnie was the King of Sturgis - the best Harley mechanic EVER) and Ronnie worked on his bike. I got very excited meeting this guy, but he took off and didn't even take my phone number. Sigh. One woman on the march took a couple of pictures of me at the demo. I hope to be able to post them when she calls. At least I got her business card. I shared my drum with a native man who had never drummed before - he's a training school survivor. He's recently sober and also wonders why AA, the Toronto Aborignal Cultural Centre and other places are SO cliquey. We have NO AIM chapter up here in Ontario and that has been my great loss. I was told a year ago today, things will get much better by the Six Nations medicine man. I believe that is the case. I will be able to help many many people some day. I am keeping my faith no matter what anyone does or says. The terrible scourge of poverty on reservations must END. Treaties must be respected, ALL treaties. I realize that I have been a bit obscure here in this essay. I just want to say this - WHEN THE CHANGE IN THE US COMES and I play out my bit, I am going to build a school in MY MOTHER'S Name in the Lakota Nation. I am going to put this entire blog on CD-ROM so that there is a good civics class and historical record from both sides of Turtle Island that they can use. We all deserve a better life .. and that means EVERYBODY. I met Robert Lovelace yesterday. I wish someone had taken a picture of it. But no one did. It was refreshing to my soul to see so many young people in attendance. I was told there were more whites attending than ever before. 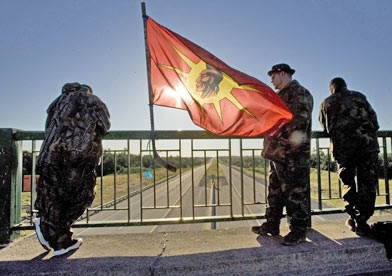 The Assembly of First Nations has declared May 29, 2008 the second annual National Day of Action for Canada’s aboriginal people. Events are planned across the country to address longstanding issues including health care, education, and housing, although court conditions will prevent many prominent First Nations leaders from participating in this year’s events. action shut down Highway 401. The Assembly of First Nations had urged participants to obey the law and focus attention on child poverty. expected to draw a few thousand participants. Although today’s events have been peaceful, several First Nations leaders have called for more radical actions in order to focus attention on key issues. Ottawa, says real change will take more than polite demonstrations. hell of a lot worse before it’s going to get better,” he said. fight for their rights and actually cause chaos for . . . the Oka area. that forces governments to pay attention. Thousands of aboriginal Canadians will gather in Ottawa and across the country Thursday for the second annual National Day of Action to draw attention to problems facing aboriginal people. The day was declared by the Assembly of First Nations to focus on issues such as child poverty, access to safe drinking water, health care, education and housing. A public gathering and rally were planned for 10 a.m. ET on Victoria Island in Ottawa, followed by a march to Parliament Hill and a rally at 1 p.m.
Last year, some demonstrators barricaded a major rail line and a highway in eastern Ontario. But organizers say action of that sort was not expected this year, and they’ve urged participants to stay on the right side of the law. Alberta chiefs were meeting Monday to discuss solutions to the longstanding problems with housing and safe drinking water. Rose Laboucan, grand chief of the Lesser Slave Lake Indian Regional Council, said she wants people to understand the challenges the First Nations are facing. “We’re not asking for the moon here. We’re just asking for adequate homes for our people, for the quality of life that everybody else has,” she said. In northeastern Ontario, First Nations will be handing out information along the Trans-Canada Highway between Sudbury and Sault Ste. Marie. Ontario Provincial Police will be helping to slow traffic down along Highway 17 for the campaign. Insp. Dave Ross, who is helping to co-ordinate the OPP’s response, said people can find out just where traffic slowdowns are across the province by going to the OPP’s web site. The National Day of Action is being held just a few days before Canada launches a long-overdue Truth and Reconciliation Commission to address the traumatic legacy of its Residential Schools program, which affected thousands of First Nations children, over several decades, who were taken from their homes and subjected to horrific levels of abuse at the hands of administrators and officials. OTTAWA (Reuters) - After decades of foot-dragging, Canada is finally about to take a close look at what one aboriginal leader calls “the single most disgraceful, harmful and racist act in our history”. From the 1870s to the 1970s, around 150,000 native Indian children were forcibly removed from their parents and sent to distant residential schools, where many say they were abused mentally, physically and sexually. Conditions in the schools — run by various churches on behalf of the government — were sometimes dire. Contemporary accounts suggest up to half the children in some institutions died of tuberculosis. One prominent academic calls what happened a genocide, yet for many years few Canadians knew what had happened. Now, for the first time, the mainstream population will be learning a lot more about what was done in its name. As part of a C$1.9 billion ($1.9 billion) settlement between Ottawa and the 90,000 school survivors in May 2006 that ended years of law suits, a truth and reconciliation commission is set to start work on June 1. The commission, which has a life span of five years, will travel across Canada and hold public hearings on the abuses.